Violence against women isn’t acceptable anywhere. It hurts everyone. However, women standing up and fighting together is powerful everywhere. It inspires us. On February 1st of this year, Amanda Figueroa, a professor in the nursing program at UNIVASF in Petrolina, was followed home by her ex-boyfriend and brutally attacked in front of her six-year-old daughter. 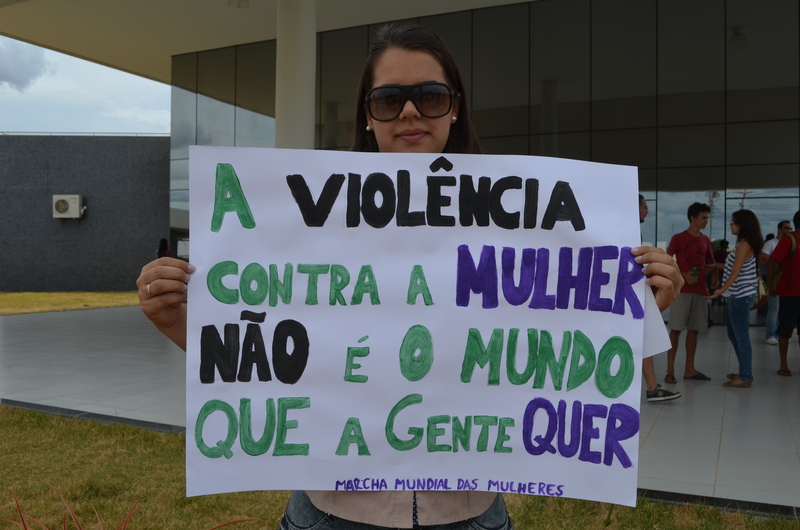 After her agressor was detained, Amanda bravely shared her story with the Petrolina/Juazeiro community via Facebook and a local blog, bringing attention to the countless cases of violence against women in our region and in Brazil. The picture shared by Amanda is horrifying; her face is so beaten that it looks unreal. The picture and story provoked strong reactions here in the region. One of these reactions was a rally on the UNIVASF campus, organized by the Women’s Collective. 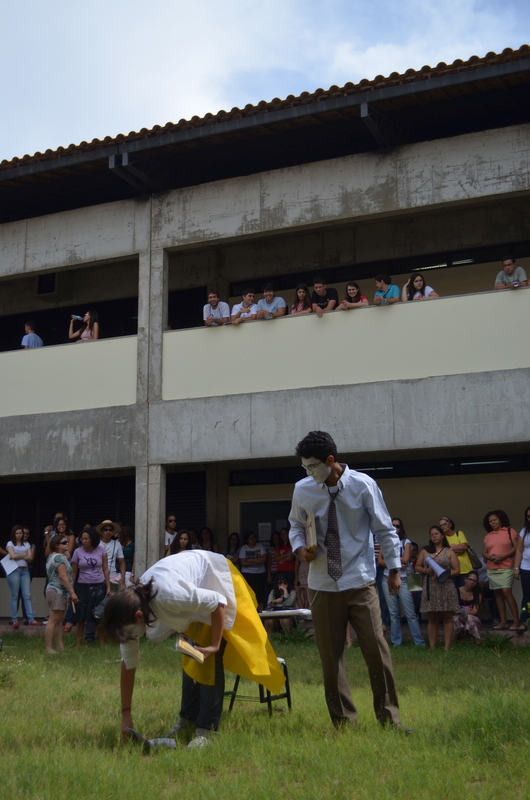 The goal of the rally was to raise awareness of Amanda’s experience and to protest against violence against women as well as the machismo that still exists in Brazilian, and particularly Northeast, culture. The speeches and songs at the rally also touched on the deeper issues of the unjust political and economic systems that bring about inequality. The rally was in many ways familiar to us–group songs and chants (see below), a march through the campus, protest signs, and a theatrical presentation to illustrate the ways in which women are still oppressed in our society. Yet the Women’s Collective gave the event a particularly Northeast flavor. One of the songs we sang has its roots in a traditional Northeast folk song that emphasizes the domestic role of women, except the version we sang turned that song into a call to “leave the kitchen and come to the street to fight.” At the end of the rally, we gathered together to sing and dance a cirandar, another classic folkloric tradition, where people hold hands circling clockwise in rhythmic step– a symbolic unifying act made more beautiful by historic roots. This was our first Women’s Collective event, and it inspired us as we enter our second (Chelsea) and third (Cara) years of Northeast life. Society in general places an unnatural value on women’s looks, but it seems especially prevalent here in Brazil, a country that is famed for its beautiful women. This stereotype clearly plays out in the psyche of women here, as makeup, high heels, hair-straightening, and other alterations to natural appearance are ubiquitous. It was so refreshing to be part of a group of beautiful women who define that beauty on their own terms. It’s inspiring to see that progressive movements are gaining strength even in interior Northeast Brazilian cities–from rallies like this one to a gay pride parade that we attended last year. 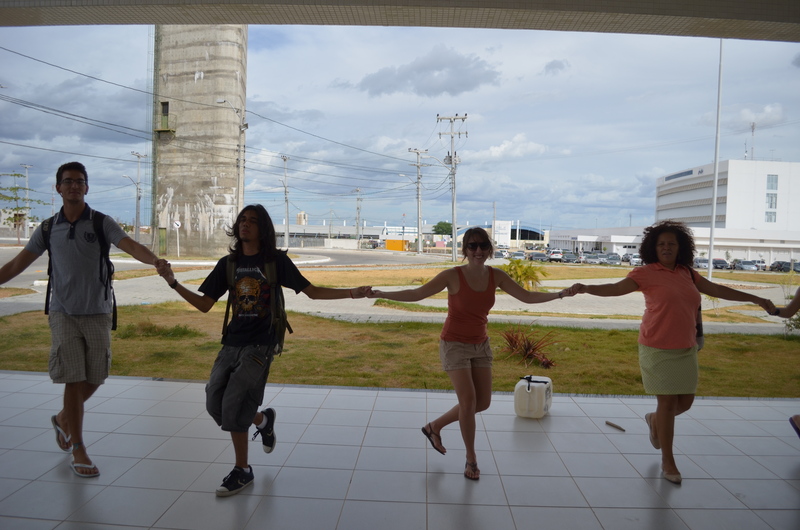 International Women’s Day (March 8), which goes virtually unacknowledged in the U.S., is a big deal in Brazil. Women are congratulated for their contributions and varied roles in society, and encouraged to continue the struggle for gender equality. The women’s collective is planning another, grander event this year with an emphasis on domestic violence awareness and women’s liberation (details to follow). No braço, na cara, nem bundinha! Somos mulheres e não mercadoria! Mulher não é só bunda e peito! Não é o mundo que a gente quer! This isn’t the world we want! 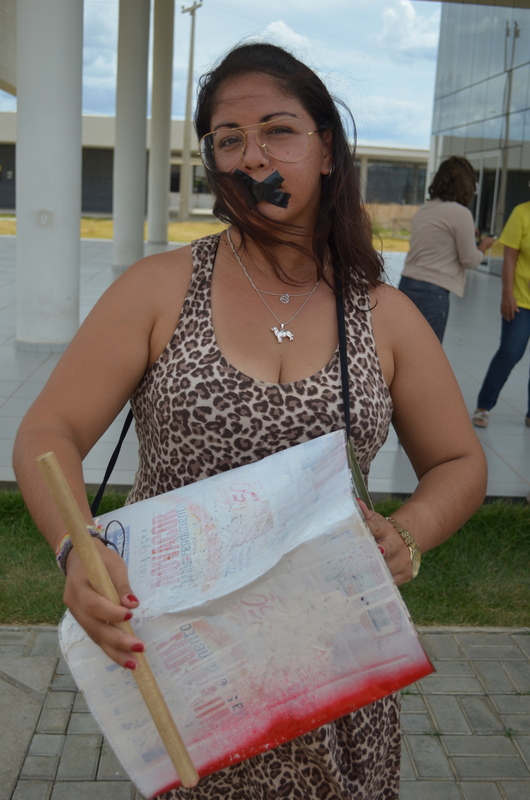 If you know anyone who has suffered domestic violence in the Petrolina/Juazeiro region, contact the Secretaria da Mulher (3867-3516), the Centro de Referência de Atendimento à Mulher – CRAM (3861-4620). Parabens to all who participated and the leaders of this action epecially Ms. Figueroa. Seeing someone we know brings this violence out of the shadows where we can see the harm it does to our whole society.